A new WorldPublicOpinion.org poll found that two-thirds of Iranians would favor their government precluding the development of nuclear weapons in exchange for the lifting of international sanctions against Iran. The W.P.O. poll also found that six in 10 Iranians believe that economic sanctions, imposed by the United States and the United Nations over fears that Iran’s nuclear program might produce an atomic weapon, are having a negative impact. Seven in 10 say they believe sanctions will be tightened if Iran continues its current nuclear program. Steven Kull, director of W.P.O., said, "Though most Iranians are feeling the bite of economic sanctions and expect them to tighten, only a third are willing to negotiate away the right to enrich uranium. However, two-thirds are willing to make a deal that would preclude the development of nuclear weapons." While the Iranian government has consistently said that it does not aspire to have nuclear weapons, the International Atomic Energy Agency has said that Iran has not been fully cooperative with inspections of its program. 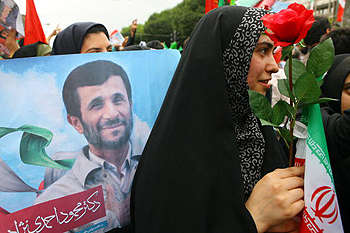 Also, while President Ahmadinejad said on September 17, in an interview with NBC News, that Iran does not need nuclear weapons, he refused to say categorically that Iran will never develop them. Kull added, "For Iran to preclude the development of nuclear weapons through unrestricted access for inspectors would represent a significant step." W.P.O. conducted the poll of 1,003 Iranians across Iran between August 27 and September 10. The margin of error is 3.1 percent. Telephone surveys were conducted by a professional survey organization calling from outside Iran. W.P.O., a collaborative project involving research centers from around the world, is managed by the Program on International Policy Attitudes at the University of Maryland. Asked to what degree sanctions have had a negative impact on Iran’s situation, 60 percent of respondents say there has been at least some negative impact, with 23 percent saying there has been a lot. Thirty percent say there has been only a little impact (15 percent) or none (15 percent). Iranians are also pessimistic about sanctions in the future. If Iran continues enriching uranium, 70 percent expect sanctions to be increased. Only 19 percent say they will not be increased. Concerns that Iran's nuclear program was not simply for energy but that Iran was working to develop nuclear weapons-grade material emerged early in the decade. In 2005 the International Atomic Energy Agency (I.A.E.A.) declared Iran to be in violation of the nuclear Non-Proliferation Treaty, primarily for failure to provide information and access to the I.A.E.A. In response, the United States and the United Nations increased existing sanctions against Iran. Nonetheless, most Iranians favor persisting with enrichment. Asked whether they would favor an agreement whereby the current sanctions would be removed and Iran would continue its nuclear energy program but agree not to enrich uranium, only 31 percent favor the idea, while 55 percent are opposed and 14 percent do not give an answer. Even among those who say they voted for opposition candidate Mir Hossein Mousavi in the presidential election, 51 percent are opposed to agreeing to give up enriching uranium, while 43 percent favor the idea. Those who did not support such a deal were asked whether they would favor another deal that would lift sanctions and allow Iran to continue uranium enrichment but would grant international inspectors unrestricted access to all Iranian nuclear facilities to make sure that it is not making an atomic bomb. Thirty-four percent (of the whole sample) say they would favor such a deal, while 22 percent are opposed. This means that a total of 65 percent express a readiness to make one or another deal that would prevent Iran from making a nuclear weapon. Most Iranians do not want a nuclear weapon, apart from the question of sanctions. Fifty-eight percent say they do not want to develop an "atomic bomb," including 3 percent who oppose the nuclear program altogether. However, 38 percent say they do favor developing an atomic bomb. Iranians also express a readiness to enter into direct negotiations with the United States. Sixty-percent favor, while 30 percent oppose "full, unconditional negotiations" between their government and the United States. This may stem in part from growing confidence in Iran's ability to withstand pressure. Fifty-seven percent say that over the past four years Iran has become better able to stand up to foreign pressure. For more information, visit www.worldpublicopinion.org.